A solid digital piano that sounds and feels great. The iOS device integration is a real bonus. Well built. Great piano sounds. Decent bread and butter keyboard sounds. Slick app integration. Professional Ivory-G action taken from the RD-300 Stage Piano. No DIN MIDI In/Out ports. Lacks dedicated sound selection buttons and sound editing controls. More colour options would be nice. The F-20 is Roland's latest digital piano and is aimed at the hobbyist/lower end of the market. Build quality is excellent throughout; in fact, the F-20 feels more pro than entry-level. The casing is very solid, yet the whole package is reasonably light for an 88-note piano (it weighs 44lbs without a stand). If you case it up for stage use, though, it becomes a two-man lift. The look is understated and blends easily into most surroundings. However, we'd like to see some more funky colours on offer rather than just brown and black - this might widen the appeal. Roland also offers a stand for the F-20 (£89) but otherwise it'll sit sturdily on a double-braced X-stand. 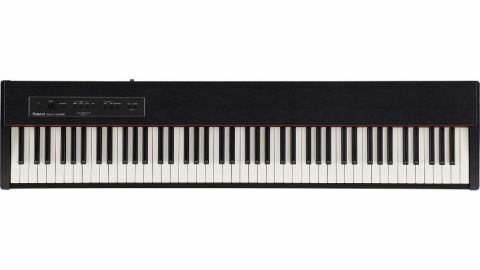 The weighted Ivory-G action (taken from Roland's pro RD-300 Stage Piano) feels superb. It's nicely balanced and fast to play with just enough weight to enable accurate performances. Control-wise there's not much to speak of - sound selection is done by pressing Piano, E-Piano or Other and hitting a note to select from several variations (you can also select sounds wirelessly with an iPad). The keyboard can easily be split/layered and there's a 'dual' function that splits the keyboard into two exact copies for duets. You can also tweak the brilliance (EQ) and ambience (reverb). The only downside is that these functions are again accessed via button-plus-note combinations - dedicated sliders would obviously be preferable. The onboard sounds (35 in total) cover most keyboard bases and the quality is generally excellent. The main piano sound has a great deal of depth and realism and is inspiring to play, while there are some authentic electric pianos, a decent Hammond B3 emulation, a pretty happening Clavinet, plus some nice pads, synth leads and orchestral strings. We wish that there was more in the way of sound editing, but the F-20's sounds actually rival those of more expensive models/competitors. The onboard speakers kick out a nice amount of volume, too, and you can also plug into a PA.
A big bonus with the F-20 is that it links to a couple of Roland iOS apps via the company's wireless USB port/key (sold separately). Piano Partner assists with aural and visual learning (beginner through to expert) and provides an easy way of learning the pitches of notes by ear and by keyboard/stave position. It's particularly good for kids, who'll love the colourful and clear visuals. Secondly, the Air Performer App enables you to stream music from your iTunes library through the F-20's speakers and change its speed - great for inspiring practising and jamming for all levels of player. Back on the piano itself there are also 32 rhythms/auto accompaniments and a song recorder. Finally, there's USB MIDI to connect to a DAW and the option to save recordings/songs or import MIDI files via USB stick. In summary, the F-20 sounds great and offers a nice balance of features for the money. If you want a solid digital piano for home and even occasional stage use you should check it out.